Why spend $3,000-$7,000 on a go-kart when you can spend $300-$700 on one and have the same exact fun racing in a competitive points series? Especially in this economy! Race a Galletta's Gas Stocker race kart for a fraction of the cost and all of the excitement - AND keep your hard earned-money! 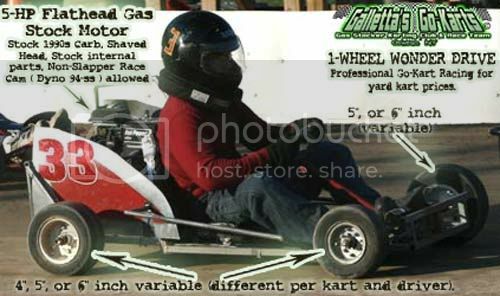 WHAT IS A GALLETTA'S GAS STOCKER KART? Gearing (Clutch, sprocket, chain): Unlike super-tuned and precise WKA-esque flat karts which race on asphalt or high-grade clay that only well-funded speedways can afford to utilize, racing on backyard speedways like Galletta's means your kart must be more durable, yet can still race on smooth surfaces as well. We use 40/41 chain with a 10-tooth clutch and 60-tooth sprocket. This is the best gear for our home track at Galletta's, and most of us keep that same gearing for when we have traveled to away tracks, or else changing several karts over twice a week every week (which we used to do) would get quite tedious. We don't use traditional and mass-produced racing sprockets because they are too fragile to be used on most backyard speedways like Galletta's. Odd that some flat-kart classes have looked down on us in the past, as our karts are more durable, more affordable, completely original, and every bit as competitive as "cookie-cutter" karts that cost four to ten times as much just to even field let alone field competitively. See our website for more details. - Briggs & Stratton �New style� 1990s-and-up style Flathead motor Box stock block. No porting or reinforcements allowed to the block without approval of all active regular Galletta's karters or as described: Bores are allowed, (A) a bore for renewed life and (B) is approved by Matt and all regular competitors. (C) You may go in every block and clean out the casting obstructions and imperfections out with a Dremel tool. Honing is allowed. No Galletta�s Team Karts have blocks altered in any other way. Obviously, overriding the governor is allowed. It's essential in a race. You can do it yourself, but if you need help, see Matt, as he has prepared and/or tuned all motors in our club. And ask anybody - when Matt tunes the motor, you are going to fly and compete for wins that day. - Briggs & Stratton Box Stock 1990s-and-up style carburetor and tank. This carburetor is also known as a "Fun Power" carb, and it is a most important staple of our club, as it is our "plate" or speed regulator because they do not have adjustable jets. One and all are the same. The jet is box stock/standard and fixed. Absolutely ZERO alterations allowed unless a casting imperfection is found, whereas it can be drilled (see Matt on how to do it and keep it spec, as he has worked on dozens of them over the years). Drilled carbs are banned, and we have never had one person use them so please do not be the first. Raptor or other racing carbs are banned due to expense. (This rule makes for a VERY even race and saves you and all of us A LOT of money.) There will be NO exceptions to this rule, as it is the best way to maintain speeds AND KEEP COSTS DOWN. If your carb does not work well, take it to Matt and see if he can fix it. If it does not work, then we will look into finding you one that does work, or show you how to fix it. Most "slow" stock Briggs 5hps are due to bad, clogged or miscast carbs. Let Matt help you in getting them run. Some may not want to race because of this reason (some people only trust their own work and others feel like someone's always out to screw them - that's NOT how we run). But this is how we keep prices down and speeds regulated. Therefore it is essential. These carbs are the only reason that we go 35-50MPH instead of 55-70MPH, AND it allows us to run 200 laps (around 27 miles) on one tank of pump gas on our home track. Beat that. - (b) a Briggs & Stratton Raptor III Rod (for durability/engine safety) are allowed. Box-Stock oil dippers are banned due to durability issues. Billet rods are discouraged due to cost, but not banned. No Galletta's team karts use them, visitors can use them if heavy. - (c) Drivers weighing over 250 lbs. may use a billet rod. To keep costs down, they are not recommended for lighter drivers because we do not set up our motors to need them like a WKA-esque or Open motor need them. Raptor rods or vinyl dippers work fine for our motor rules. - Anything else must be explained and approved by all active regular drivers and kart owners. - (A) Briggs & Stratton Box stock air breathers. Drilled air holes allowed. - (B) Racing breathers discouraged, especially for drivers under 200 lbs.. No Galletta's team karts have them. You may use them if nobody else minds, but we do not enforce or ban any. We just think of them as cheaper to go with the stock ones, so we make them the staple. - (C) They now sell "Fun Power" Air filters in karting supply places, which are legal if you wish to have one, especially drivers over 200 lbs..
- (A) Briggs & Stratton Box stock cam allowed for drivers between approx. 100-130 lbs. - (B) Dyno 94-SS �hot stocker� cam is allowed for drivers between approx. 165-220 lbs. - (C) Dyno 98-3 cam is allowed for our heavier drivers over approx. 210-220 lbs. - (D) Dyno SS-03 cam is allowed for our heavier drivers over approx. 225-275 lbs. For drivers around 220 lbs.-and-up, see Matt, you can have a bigger cam with approval. We do experiment with drivers that are so heavy that they cannot compete with the others. Anything else must be explained and approved by all active regular drivers and kart owners, and if approved via a vote of ALL active drivers and kart owners, possibly tested , and if approved, then then implemented into the rules. If your cam is a "slapper" cam that needs block reinforcement, then you use at at your own risk and we would consider it illegal unless you are a super-heavy driver over say 275 lbs. or so. Our club is flexible and with this power-to-weight system, our racing is inclusive and more competitive than ever. We don't like 5-10 classes of 1-8 karts, we prefer 1 class of 10-20 karts. That's real racing, and our rules allow for that. - Briggs & Stratton box stock coil. No Galletta�s team karts contain hot coils. Anything else must be explained and approved by all active regular drivers and kart owners. If you don't know, it probably is a stock, so we'll allow it. - Briggs & Stratton box stock flywheel. 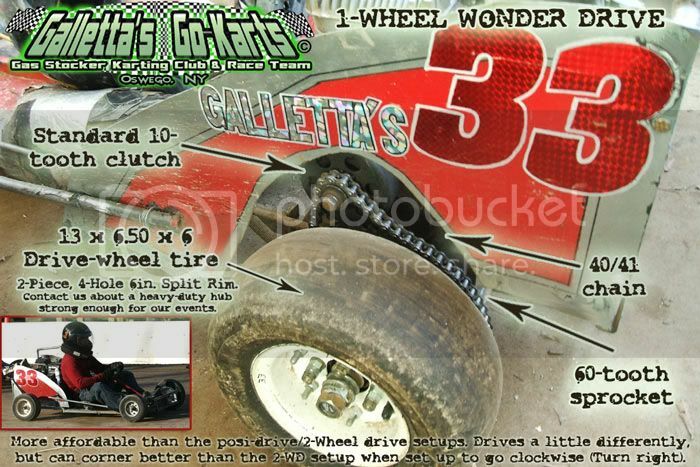 No Galletta�s team karts have 3-4hp flywheels. Anything else must be explained and approved by all active regular drivers and kart owners. If you don't know, it probably is a stock, so we'll allow it. - Briggs & Stratton box stock crankshaft allowed. Single or dual bearing allowed. Most of our Galletta's Team Karts are standard, no bearings, but some of the motors are single-bearing, some dual-bearing. We have no set rule against it, as it doesn't increase speed, just increases life of the motor. We have no ruling for or against crankshaft types, but all changes must be explained and approved by all active regular drivers and kart owners. If you don't know, it probably is a stock, so we'll allow it. - Briggs & Stratton Piston allowed. Pistons/rings should be box stock standard. Boring/replacements allowed after excessive wear. (.10, .20. .30 are only allowed as the motor wears, as each motor has a life cycle.) We have no firm rules in this department, but no secrets; all changes must be explained and approved by all active regular drivers and kart owners. If you don't know, let Matt check it, but it probably is a stock, so we'll allow it. - (A) Head may be shaved for extra horsepower. All Galletta's Karts have hand-shaved heads via sandpaper and drills, shaving it very deep and porting the head. We allow this because it is an exceedingly cheap way to increase horsepower. Professionally machined heads are discouraged due to cost, but they are not illegal. Matt will assist all head shaves for free, or do one exactly the same as all 12+ Galletta's Team Karts and visitors if you pay him for his labor. As with all things in our racing club, if you try something different, you must have it approved by all regular drivers, but we'll probably allow it. From 2000-2008, we did not have an official weight requirement, though we experimented, we could not make an official rule because being forced to race bigger motors at Oswego Kartway (and we tried to stay light to compete). In the past, the average driver weight was between 140-190 lbs., and the karts were between 145-165 lbs., and we'd try to keep heavier drivers with lighter karts and vice versa and hence it averages out fairly close. But with heavier drivers (mainly those over 200 lbs. ), for the 2009 season and beyond, we institute special rules and at least a median weight requirement and no longer race against bigger motors in our point system. Now, heavier drivers are allowed a bigger cam and a power gear, while lighter drivers are not. Also the lightest drivers are weighed down to a minimum. The result has been a huge increase in different winners at Galletta's, and easily the most competitive class to go along with being the most affordable. Between 2007-08 we allowed heavier drivers headers and certain race cams, and we've considered raptor carbs for drivers over 260 lbs., but since they are expensive, we will decide against them unless the heavyweight driver needs them to compete and it is approved by all active drivers. We are open to active drivers voting rules in and out, and run with what the majority decides. Discuss it with us anytime. At Galletta's, we use (as explained above) a single-wheel-drive setup that turn right (clockwise) on dirt oval kart tracks. They don't sell pre-fabricated racing chassis like that; Another oddity that makes us unique is that all of the karts in our class are homemade, hand built (or rebuilt from a yard kart or racing kart) chassis. We have no "cookie cutter" frames in our class whatsoever, although some of our drivers have pre-built frames, all are completely re-built for racing in our class. It's a build-it-and-race-it type rule. We are open-wheel only, which forces each driver to race cleaner to avoid accidents; no bump-and-grind type racing in our class; you pass clean or you lose. Bumpers and nerf bars are not banned, but nor are they mandatory. Rules are subject to change, and do so with both a majority vote of active regular drivers and the suggestion of track operators. More in our extended rules & racing etiquette section. We also have two ALL-TIME POINTS series at two tracks in Central New York. Galletta's Backyard Kart Speedway All-Time Points and Oswego Kartway Gas Stocker All-Time Points! - Any motor type can race in their own class if they have enough karts with equal motors to support. However, at Galletta's Karting Speedway, we only have one regular motor class - the Briggs & Stratton 5hp Flathead Gas Stocker stated above. - All OHV (Over Head Valve) motors, or WKA-rules methanol motors are both illegal to run against Gas Stocker Flathead motors under Galletta�s Karting rules under the same scoring system and same checkered flag, though they may run their own division on the same tracks (and do at Oswego Kartway), or even race the same race but score them separately and each motor class gets its own winner. We have nothing against anybody who prefers a different type of motor. Our particular favorite, the Briggs & Stratton 5 horsepower flathead, is no longer being produced. The Overhead Valve motor is what most companies produce. This is completely understandable if you want to buy a brand-new motor, as we stick to mostly slightly-used Briggs 5hp FHs. The answer is yes you can race with us with a different motor. However, you will not be counted in our particular Galletta's points system. A separate scoring system can be arranged for you with similar or identical principles, but the main Galletta's point scoring system is under the above listed Galletta's Gas Stocker motor rules until otherwise noted. However, any motor used must stick to identical principles: It must stay stock parts, modifications must have a strict limit set, it must run on pump gas, and it should remain in the spirit of equalized competition. For example: If you take a different motor and you are much slower than the average Galletta's 5hp kart, then you need to get the motor up to par. If you take a different type of motor and you are a beginner and you are blowing away 15-to-20-year karting veterans in Galletta's 5hp kart, then perhaps you overdid it and your horsepower rating is a bit too much. If you take a different motor and you are right in the thick of the pack competing with everybody and any wins are hard-earned and highly competitive, then we got it just right. Either way, if speeds can be equalized, and the motor brands aren't forced to compete for the same points and the same checker, then they can be allowed to compete on the same track. We've tried this before to some success, although it needs fine tuning. We have also tried competing against each other, and this absolutely cannot work, as it breeds hard feelings and creates an atmosphere ripe for cheating. This is one of the things that the Galletta's Kart Club is very stern about. (1) No fighting, (2) no cheating, (3) no intentional or grossly negligent wrecking, and (4) affordable / equalized / tough competition. That's what all racing should be, but it is what was guarantee. Regardless, we occasionally encounter arrogant snobs, rude ignoramuses, and mindless bashers online and at tracks who race WKA-type methanol karts and look down upon us. We hear it all the time when they say, "They go the wrong way" or the ignorant "But they're just yard karts!" and (yes, we've seen and heard it) accusing us of being retarded. The reasons why are mostly due to disrespect and a lack of understanding about this class which we invented in the early 1990s and what we are trying to do. A grass roots racing division built from scratch, our karts are purposefully set with rules to keep the karts affordable, safe, and highly competitive. In addition, with our "gas stocker" rules, we can get MANY more laps off one tank of gas than they can get with a tank of methanol. This means, like The Tortoise and the Hare, a WKA kart could win a sprint race any day, but a Gas Stocker would win a marathon every time, proven with our Annual Galletta's Klassic, which has been 100, 150, 175, and 200 laps over the past few seasons. Our class offers diversity and originality. Other classes... well, honestly, they all look alike, other than colors and numbers. When it comes down to it, our class offers more winners, closer competition, and often times better overall shows than the other classes, proven by countless DVDs that were produced in 2007 and 2008 of our karts on the same tracks as our more expensive counterparts, putting on equal-to-better shows (higher kart counts, closer racing, and more photo finishes) for a fraction of the cost. Also, drivers in our class also do well in every other class they try. And real racers race anything, not just the most expensive thing money can buy. If you disagree, you are living proof to all of those 'dumb-redneck-racer-fan' jokes that so many people tell. And we always note that the mockers are either people on the outside looking in, or just jealous losers. So before you mock, learn a little something, and give it a try. You might win, you might lose, but you will respect what we do at the end of the day. And for all of the extra cost of a WKA kart, watch us race on the same track as them, and with an unbiased opinion, tell us who gets the most competitive racing and the most speed out of their dollar? The answer will be obvious to all but the actual WKA-driver or their immediate friends and family. Our races are usually more competitive, can race 3-wide far more often, can corner better because of our single-wheel-drive setup, and are only around one second slower than most methanol karts on a small track such as Oswego Kartway (except maybe the WKA Medium weight division). You are talking hundreds, if not thousands of dollars cheaper, and just for a little extra speed out of a kart. We aren't bashing the more expensive forms of racing, but we are using some apologetics; in other words, defending our brand of racing with facts and evidence against those who do not understand what we do and look down upon us (and we have seen and heard it countless times). Especially when the veterans and inventors of the Galletta's Kart Racing club have nearly 20 years of karting experience and a huge win percentage on two tracks to prove their skills, including never losing a points standings or championship on two tracks every single year. As stated, once we are all box stock gas 5hps. Then, in 2004-2005, a few guys came along and invaded our track with 5.5hp OHV (and 6.5hp OHVs pretending to be 5.5hps). On a trial basis, we allowed them, as it meant 12-16 kart races instead of our usual 7-12 karts. However, we noted that nobody in a 5hp could compete with that extra 1.5hp (unless the bigger motored karts broke, or made "rookie" mistakes that the lighter and more experienced 5hps could capitalize upon). To answer, we altered our rules (majority vote of all active 5hp drivers) and allowed the smaller 5hp motors to shave (or mill) their heads, which then started a 1-upsmanship war between the two motor classes. To keep our class affordable and stock, we stopped racing the two different motors together, and invited the others back with 5hp-only and a weight rule, or still race on our track in their own OHV class separately. Since we held to our existing rules and requested that they race 5hp flatheads only against us, they stopped racing at our track and dubbed themselves, "The Outlaws." We had no hard feelings against them, just used different motors. However, there are a handful of people-most importantly the Oswego Kartway Track Operator-who believe that a 6.5hp "Outlaw-type" motor and a 5hp "Galletta-type" kart can compete together, simply because they both turn right and aren't governed by WKA rules. When Oswego Kartway opened in 2006 and we started racing there, track officials have repeatedly tried to change our karting club's rules via forcing us to race against the bigger 6.5hps or not race at all. For short periods in 2006, 2007 and 2008, the engines appeared to be mildly equalized to the outside observer. But it wasn't truly, as the "too-much-horsepower" vs. "too-light" over and over again; the war going back and forth but never utterly equalized nor fair for all drivers involved. However, the 1-upmasnhip games resumed AGAIN, and now neither OHV or Flathead motor clubs are box stock as originally intended. They are now all tweener engines somewhere between 'box stock' and 'racing.' A no-man's land where it is difficult to find newcomers to join unless we help them set their motors up (which we do to anybody who asks). Again... it was a fight between the two divisions, with one saying, "The Galletta's karts are way too light!" and the other saying, "The Outlaw karts have way too much horsepower!" In mid-2008, the decision was made to split the classes after it was revealed by multiple sources that the "Outlaws" were using "Animal" parts and fuel additives, which is utterly overkill because the flatheads do not use Raptor parts (except for the rod), and no additives. Weight or no weight, it was too much, especially mixed with unsportsmanlike conduct such as post-race mockery as added insult to injury. Though both sides agreed to this split, the Outlaw class proceeded to mock the Galletta class, even when they raced in separate races. On one final occasion in 2008, we took a cue from the WKA Jr. 1 and Jr. 2 classes at Oswego when we tried to mix the classes under the condition that each class would race on the same track at the same time, but two different point series and two different winners (OHV Outlaw and Flathead Galletta's), . However, the Outlaws then voted the Galletta's class out of even this compromise, and then resumed their mocking of the Galletta's class in person and also (rather cowardly so) as anonymous posters on the Oswego Kartway forums. The Outlaw Class has since apologized and we have accepted. We harbor no hard feelings, and would love for them to race on our track in a separate series. Our problem no longer is with these guys... it is with one very stubborn man who controls the fate of Oswego Speedway's small dirt track. However, Oswego Kartway track operators seem to again try to force the two motor types together for 2009. Why? WKA doesn't allow flatheads (Raptors) to race OHVs (Animals), so why Oswego Kartway does is irrational and illogical. We've tried it in 2004, 2005, 2006, 2007, and 2008, and it didn't work once, so why still try? Because the two classes got comparable time trial times and there aren't enough "Outlaws" to make the minimum? Again, it is heavy and powerful vs. light and quick. On the same track, they don't mix fairly, and one side always has the 1-up. The same tired old argument again and again. "Too light" vs. "Too much horsepower." Because Matt wins too much and he's one of the lightest guys? Well, the minimum weight rule should solve that, right? It's also highly illogical and hypocritical that now the same track is making "box stock" clone motor classes when the same officials forced us to stray from our original box stock rules by forcing us to race bigger motors! So, in fairness, we'll call it as we see it: OK... we'll race against 6.5hps Outlaws the same day that we see WKA Champs race WKA Medium and/or Heavy flat-karts all race together. Or "Opens" vs. WKA Champs. Or Jr. 1, Jr. 2. and Jr. Champs all run the same time. Or, when we see no other 1-3 kart classes out there. Otherwise, it is what it is... discrimination against our karting league, which has brought 6-12 paying customer karters to your track every single week since 2006. Does the truth hurt? The only mistake that we ever did was to allow bigger motors to race with us. It stops now. We didn't even have a problem with racing at the same time but scoring separately, but no more different motors going head-to-head. The history lesson is ended, and as a final solution, all active Galletta's drivers have elected to solidify and stick to our rules as seen above. In short, it is: 1-WD, Pump gas only, Raptor rods, shaved heads, 100% Box Stock 90s-style carbs, and certain pre-approved Dyno Cams. In addition, for 2009, we will have a minimum weight rule (the best medium weight between all driver/kart combos will be the absolute minimum weight allowed, and any below it will result in a disqualification, above it will be allowed headers). We planned to institute one in 2007 and 2008, but forced to run against 6.5hps, our lighter weight was our only saving grace against such power differential. No more "horsepower" vs. "light" duels. The Galletta's Karting Club is equal-motor 5hp exclusive with a minimum weight rule, and it doesn't race on any track that discriminates against us and forces us to race bigger motors, or (laughably) weighs down people every time they win. Period. We race weekly all summer at Galletta's Greenhouse Karting Speedway (a not-for-profit, race-at-your-own-risk, recreational-use backyard dirt oval track), and Oswego Kartway, a small clay oval located in back of its parent track, the famed paved oval (and Home of the Supermodifieds), Oswego Speedway. Take a look at our two-track total in points for the 2008 season between May and September! The Galletta's Go-Karting Club was founded by brothers Matt and Chris Stevens in the early 1990s when they modified yard karts for racing purposes. They are the inventors of "clockwise 5hp flathead gas stocker kart" racing, and have a 13-kart race team that includes several backup karts available to be rented and raced at both Galletta's and Oswego Speedway all summer. Invented with specifically "gas stock 5hp motor" rules so that a person doesn't have to spend thousands of dollars to race in extremely competitive racing events, the class grows in talent and competition every single year. Join us by building your own kart for around $500 or rent one of our team karts on Summer Thursdays or Summer Sundays in Oswego, NY! Galletta's is a backyard karting track that does not charge anybody to watch or race (though we ask for clay donations). 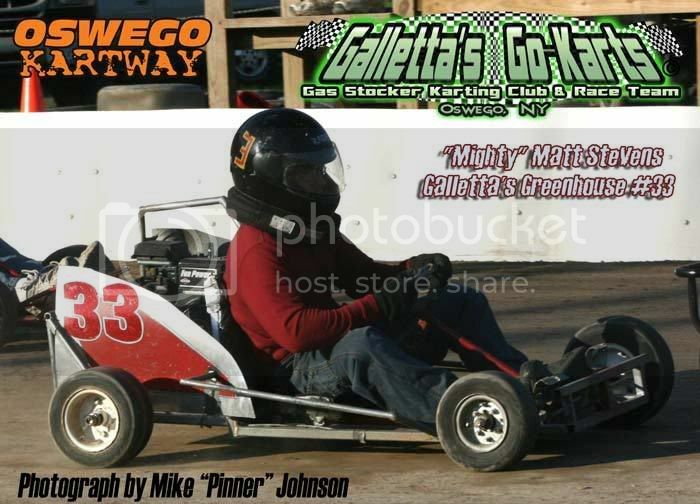 If you want to rent a fast Galletta's 5hp Gas Stocker Kart on Oswego's dirt karting tracks, then inquire! There's always at least one or more karts open and waiting to be raced! Bring your own 5hp gas stocker kart or rent one of ours and join us! We usually run 8-12 kart races weekly, but we'd love to have more on both tracks that we race at, so we ask for more people joining us. Experienced drivers or beginners? It doesn't matter, you can race! Interested? Call us up! 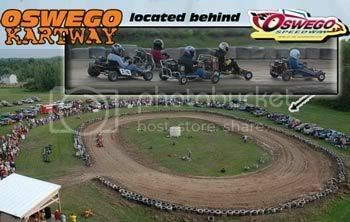 Plus, everybody is getting tuned up for the Oswego Speedway Classic weekend at Oswego Kartway. Did you ever think that you could be racing at the famed Speedway on Classic weekend? You can, and for VERY affordably. Rent one of our karts for $20 a week (averaging around 100-130 laps of action on two different Oswego tracks), or we'll help you buy or create your own for just a few hundred dollars. Call us up or email us and find out more details. Want to join us? We invite drivers (either people to rent our karts and/or with their own 5hp karts) to join us and race at Oswego and Galletta's. We have our own motor class at Oswego now, but still need regular drivers to fill the karts. If anybody is interested in filling a kart on Thursdays at Oswego, or Sundays at Galletta's ($15 for a 10 lap heat and at least 45-lap feature, $10 for just renting at Oswego, and $20 to rent one at both Galletta's and Oswego), just contact us. At Galletta's, it is free to bring your own kart (though we accept $3-5 clay donations).